Welcome to OrthoAnalytika, Fr. 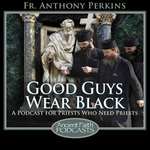 Anthony Perkins' podcast on spirituality, science, culture, the paranormal, prepping, and current events - all from a decidedly Orthodox Christian perspective. Fr. Anthony is the rector of St. Mary's Pro-Cathedral (UOC-USA) in Allentown, PA; Professor, Vocations Director, and Associate Academic Dean at St. Sophia Seminary (UOC-USA), and a retired intelligence officer. He has a diverse background, a lot of enthusiasm, and a big smile. See www.orthoanalytika.org for show notes and additional content. Where do we get our spiritual strength? What is the source? Is our spiritual health fragile and dependent on the circumstances, or is it robust? Sunday of the Veneration of the Cross.